It’s Halloween season, which means all the usual trappings that come with this time of year: pumpkins, corn mazes, shockingly-early Christmas advertisements, and the annual “Treehouse of Horror” episode of The Simpsons. One of many Treehouses of Horror. But as I thought about the upcoming “Treehouse of Horror” episode, which I may or may not watch, I started to wonder: do the regular episodes of The Simpsons all take place in the same continuum? Are they actually one story about one family in one town in one universe? Is there such thing as a canonical Simpsons episode? Does The Simpsons make any sense at all? 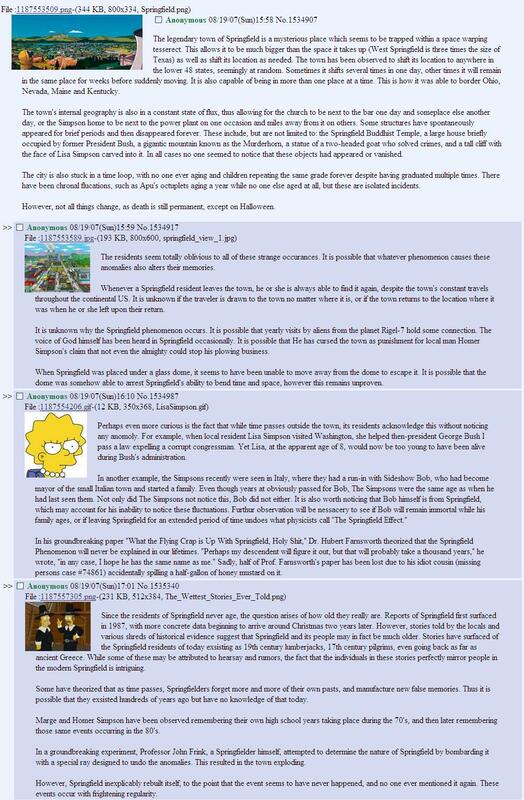 And thus, a new fan theory: every single episode of The Simpsons takes place in a different universe. My suggestion is that every time we see an episode of The Simpsons, we are getting a glimpse into a slightly different version of Springfield and this family. There is an infinite amount of universes in which The Simpsons exist. No two episodes show us precisely the same family or the same world. Sure, sometimes a character will remember something from a previous episode, but they are only remembering a similar instance to what we previously saw. Every Lisa, Bart, Homer, Marge, Maggie, and the rest of them are always slightly different, like the differing iterations of Spock and Kirk between the old Star Trek and the new one. If every episode is a different universe, this theory explains all the continuity issues and changing details. Homer and Marge were once Baby Boomers; now they’re on the young end of Generation X.
Waylon Smithers used to be black. Homer once was in a Grammy-winning band, which appears to have been mostly forgotten and irrelevant. Seymour Skinner was revealed to be an impostor, with a stolen-identity Draper-esque plotline, before the entire town agreed to never speak of it again. Apu’s children age while other characters (such as Maggie, who should be older than them) stay the same age. Remember “The Principal and the Pauper,” in which Principal Skinner is revealed to be an impostor, and then no episode ever mentions it again? Was that the only universe in which this strange event happened? West Springfield is three times the size of Texas. There’s a mountain called the Murderhorn that doesn’t otherwise exist. Paul McCartney lived above the town’s convenient store. Hard to believe that this moment is meant to be remembered by the characters in every subsequent episode. This theory would not only eliminate the need for such a “tesseract fan theory,” but also eliminates the need and evidence for the “Homer is in a coma” theory. It explains why no one ever learns any lessons. Episodes of The Simpsons regularly end with a character learning a lesson. Or multiple characters. Or the entire town. But when the next episode begins, these lessons aren’t remembered. The events that triggered them rarely even are. This might be the greatest example of a lack of continuity. How many times has Homer tried to be a better father, a better husband, a better man? How many times has he quit drinking? Unlike Randy Marsh or Sterling Archer, an action that Homer does in one episode will have no effect on himself in a future episode. And what happened to all the role models that Lisa has had: does she remember Bleeding Gums Murphy? And perhaps that is why this theory is needed: it makes us feel better about the lessons that the characters gain from their triumphs and pitfalls. Imagine that there are countless versions of Homer who has learned his lessons, countless successful Lisas. Perhaps a version of Barney Gumble who is still sober. Maybe even a version of Homer who didn’t have the crayon re-inserted into his brain. And finally, this theory explains what happened to Troy McClure. Is any character more missed? Perhaps, if this theory is true, there are universes where Phil Hartman’s Troy McClure still exists. Enjoy this? Check out more Fan Theories here. The episode “You only move twice” also ends with Hank Scorpio taking succeeds in taking over the east coast yet this there’s no reference to this in any other episode.